Do Hobbit Houses have underground electric? Hello again Hobbit Hollow fans. Todays topic: Getting power to a Hobbit house. 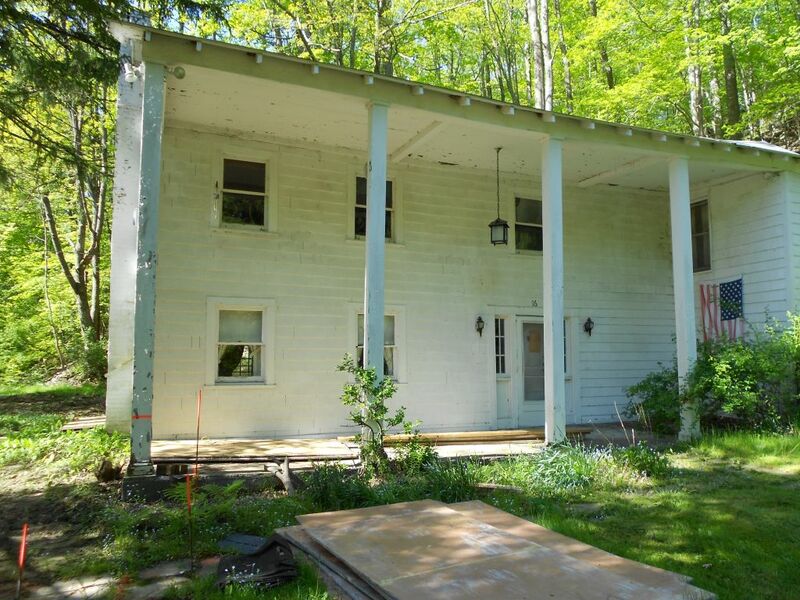 Remember the house that was standing on the property before we demo-ed it. That actually had electrical lines running to it from across the street. Part of the demo process was to call the electric company and have them disconnect the overhead wires. These wires went from the road over the stream and were attached to the second story of the house. This is pretty typical of most homes. House before demolition. Electric wires are on the upper left. Once the power was cut and the lines removed the problem was how to get power back to the property and into the new house. I knew that the electric was going to have to go underground. The Hobbit house I am going to build is only going to be about eleven feet high. Running an overhead line to the house itself was not going to work. The Hobbit house does not have an exposed side to attach wires to. Even if it did I would have to run a pole right beside the house and I didn’t think that would look good. Across the street stood the pole that the original house wires were attached too. 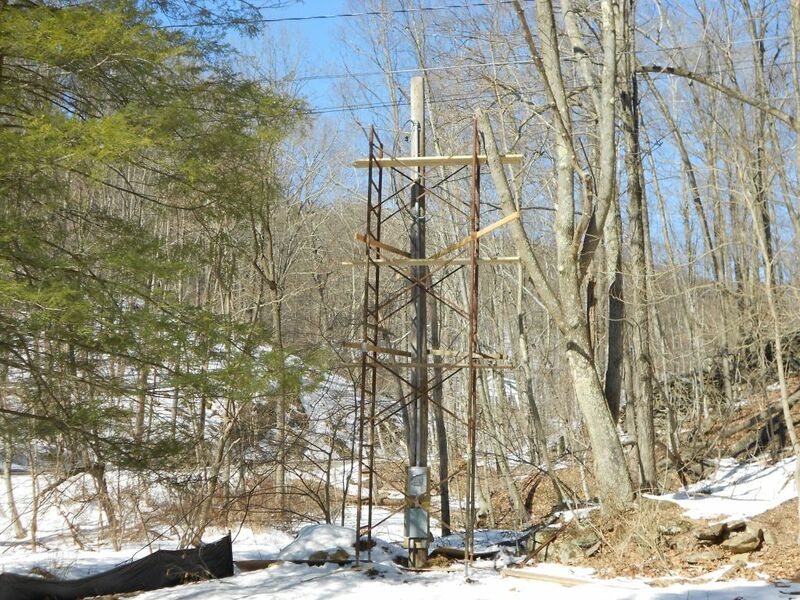 I just figured I would have to add a pole in the general vicinity of where the original line came onto the property. I met with an electrician on the site. I figured it might be a good idea to get some input into how much this is going to cost and if there is anything else (i.e. permits, fees, etc.) that I need to do before calling the electric company again. The guy I met with was great. His original idea was to run conduit under the stream from the pole on the street side right to the new house. As soon as he said that I was like: forget about that idea. 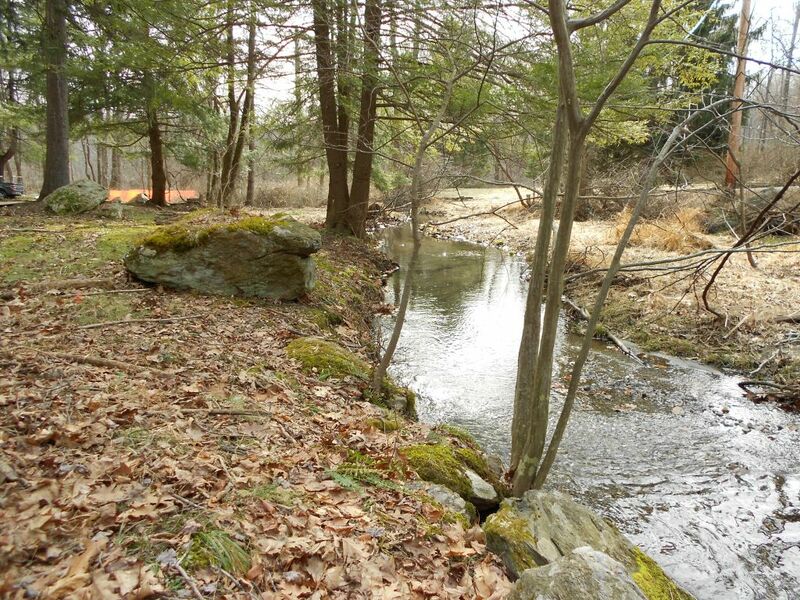 This is a trout spawning stream in the state of New York. You want me to get locked up for killing all the baby trout in the state???? What is this guy, some kind of a wise guy? (For those of you who are unfamiliar with what a wise guy is watch the movie Good Fellas.) His next question was- OK but why do you want to put the new pole on the property in this location? Why not put it in the back and put a temporary service on it. This way the pole won’t be in the middle of your back yard and you can trench the final service from the pole into the house later. You can also get temporary power and not have to use a generator for power during the construction phase. The Lord works in mysterious ways! What great ideas! I got a price from him. This is the stream the power lines have to go over. If you look closely you can see the street side telephone pole on the right. After this meeting I got a few more prices and got quite a range in price. I forget the details but for some reason I was not able to have anyone do this work right away.I think the bridge wasn’t done and everyone said the truck to install the pole was to heavy for the wood bridge. Anyway, by the time I had the bridge done everyone was busy or didn’t return my calls. What’s up with these guys? I go to the bank one day and I see a guy who’s got an electrician sign on the side of his truck. I ask him if he installs telephone poles and does service entrances. He says no but gives me a number for a guy who specializes in pole installation. I was like this is great. I call the guy up and he winds up giving me the best price for pole installation and I schedule him to come out and do the work. I finally have a pole! I again try getting an electrician to come out and install a meter on the pole but have no luck. It is then that I remember my father. My father passed away a few years ago and he was the one who taught me how to wire houses. He wasn’t an electrician but he built and wired his own home way back when in the late sixties and was a real student of whatever he was working on. I built a few houses and renovated a few others over the years and he always was really into doing the electrical work. He really liked to do the service entrance the most and this would have been right up his alley. How could I not do it myself? The big issue here is that you have to get an inspection for the service and have it approved by the fire underwriter before the electric company will hook you up to the grid. So I have a pole, now the challenge was how do I mount the meter on the pole and run the conduit up 25 feet to the top of the pole? There is no way you can use a ladder to do this. So I needed to set up a scaffold. I had some old scaffold at my house and had my sons help me put it up and secure it. I used 2X4s and what they call nailing cups to tie the scaffold to the pole. Once you have scaffold over 12 feet high it becomes unstable and can fall over if it is not securely braced. This scaffold was about 25 feet high. I used screws on the bottom to level the system up before I started. Here is a picture of the scaffold with the meter and conduit ready for inspection. The box below the meter is a 100 amp temporary service with 2 outlet boxes beneath it. Electrical pole installed with working scaffold in place. 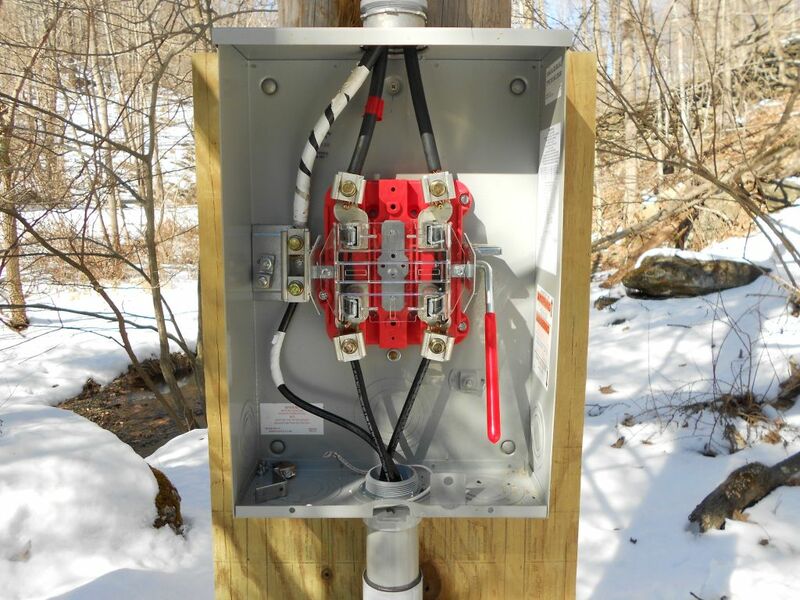 The wires that are used have to be resistant to sunlight because when they are connected to the overhead wires they will be outside of the 2 inch conduit running up the pole. Another item that is critical is the grounding rods that have to be installed. The grounding system consists of two half inch diameter copper rods 8 feet long that have to be driven straight down into the soil about 6 feet apart. I thought for sure we were going to have trouble doing this, there’s rock everywhere on this property. We took turns. I held the rod and my son used a 10 pound sledge hammer to drive the rods into the dirt. Then we would switch. It took us about 20 minutes or so. There was only one time I think we hit a rock but we were able to bust through it. Here’s a close up of the grounding system. Grounding system for the electrical service. You can see the grounding rod attached to the green wires on the left. Another very important part of the installation is to label the wires coming into the meter. There are two “hot legs” and one neutral. The neutral wire has to be marked with white electrical tape inside the meter and at the top of the mast where it comes out of the weather head. If you don’t do this the inspecter will fail the installation. Here’s a picture of the wires coming into the meter. Meter wired and ready for inspection. My father would have been proud. I thought of him a lot while I did this work. I miss him. I talked to the building inspector this past week, also. He said he should be done going through the house plans by the end of the week. Hopefully we will be issued a building permit by Friday. And what is the matter with those New York Knicks? Maybe we need to write to the new Pope for some help on the court. Building a Hobbit House: More than meets the eye or the eye of Sauron. Bag End: A Passive House. Huh?